Nokia Lumia 1020 – Finally a long awaited device Nokia Lumia 1020 is just announced on an Event in New York . The phone packs with robust & stunning 41MP camera probably be tha same that you had seen on Nokia Pure View 808 . The Camera features Optical Image Stabilization ( OIS ) to provide well focused and stable images . Nokia Lumia 1020 no doubt , will compete with Samsung GALAXY S4 zoom . The device already created lot of buzz & was in the news since its camera samples are uploaded . But Now the specs of Lumia 1020 are revealed . The 1020 will have 4.5inch Pure Motion + AMOLED capacitive touch screen clear back display of 1280×768 pixels resolution . It will be powered by 1.5gHZ Dual core Qualcomm Snapdragon processor paired with 2GB ram to make it snappy . The smartphone is running on Windows Phone 8 OS . The device is 10.4mm thick & weights 158grams . 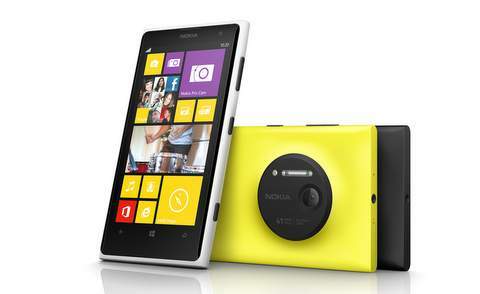 At the back the Lumia 1020 will have 41MP image sensor Camera with BSI sensor . The camera features optical image stabilization , 6Lens optics , 3x zoom , Xenon flash & 1080p video recording at 30fps . To make the device more approachable Nokia has included Pro camera app .The Nokia 1020 has IHF speakers , 3.5mm audio jack & 2 Microphones for better audio experience . The internal memory of the device will be of 32GB . The Nokia 1020 Lumia will be powered by 2000maH battery with wireless charging supported . The handset will offer LTE / 3G , WiFi, Bluetooth 3.0, GPS with Glonass , micro USB and NFC connectivity options . 4.5inch (1280×768 pixels resolution ) Amoled capacitive touch screen . 1.5gHZ Dual core Qualcomm Snapdragon CPU . Windows Phone 8 ( wp8 ) . LTE / 3G , WiFi, Bluetooth 3.0, GPS with Glonass , micro USB and NFC . 41MP camera with optical image stabilization , 6Lens optics , 3x zoom , Xenon flash & 1080p video recording at 30fps . 32GB ROM ( on board storage / internal memory ) . The device will priced at $300 . Nokia Lumia 1020 wouldl be launched on 25th JULY . You can see video Review of Nokia Lumia 1020 above .